How long does it take for a GSA Contract award? Subscribe to the TurboGSA Blog! GSA Schedules are a tremendous tool for firms wanting to do business with the Federal government. This page describes the program in greater detail. The Federal Supply Schedules program is a federal contracting program administered by the US General Services Administration (GSA) and the VA Schedule program by the Department of Veterans Affairs. The VA administers the program for firms that sell medical equipment, supplies and services. These programs are so popular that nearly $50 billion dollars in purchase orders and task orders went through these government contracts last year. GSA provides government agencies with fast, flexible, cost-effective procurement solutions, making it easier for agencies to buy from companies who hold a GSA contract. This section provides valuable information to companies thinking about obtaining a GSA contract for building their federal business. This is not GSA Contract for Dummies, but it does attempt to simplify or summarize the GSA Schedule program, which is quite complex, especially for those relatively new to the federal market. all computer hardware and software products and IT professional services, are grouped together under GSA Schedule 70. All advertising and marketing services will be found under Schedule 541. Building products would be found under Schedule 51, known as the Hardware Superstore. If a firm wants to sell its products or services to the government, then it chooses the best schedule (s) to list its offerings. It then submits a proposal to the government to receive a contract under that schedule. If GSA determines that the firm is qualified and offers GSA a favorable price, GSA awards a contract. Look here for a complete listing of all schedules. It will also show you a list of all firms that hold a GSA contract. This contract program is consistently ranked by federal marketing professionals and federal agencies alike as one of the most important tools a business can have. Small businesses in particular will benefit from getting on the GSA schedule list. it has options for three additional five-year options, so it is potentially a 20-year federal contract. Any Federal agency can buy off this contract, as well as State and local governments under some circumstances. The contract does not guarantee success and sales are not automatic. You must still market to the individual agencies, but a GSA contract makes it easier for agencies to buy from your company. If you want to be a successful government contractor, then this is a must-have tool in your marketing toolbox. Is Obtaining this Contract Complicated? Obtaining a GSA contract is a complicated process as the government tries to determine if your firm meets its criteria for what they term a responsible vendor. 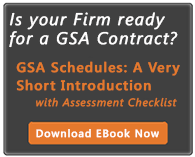 This free EBook provides you with more valuable information and contains checklists to help you decide if a GSA schedule will benefit your firm. TurboGSA is a recognized leader in providing personalized, responsive service to our clients, and we work with GSA personnel everyday to ensure your GSA schedule is expeditiously awarded. Businesses benefit from a MAS contract because it allows you to sell to any agency of the federal government as well as state and local governments under certain circumstances. Having it provides you with marketing cachet, and agencies know that your firm is pre-qualified to sell your GSA listed products and services. It also helps firms avoid the open procurements typically found on FedBizOpps.gov. GSA posts contract opportunities that are only available to you if you are on the GSA list of approved GSA contractors. And best of all, the average time to get a purchase or GSA Task order is 15 days, compared to 265 days for FedBizOpps solicitations. Up to 20 Years: It's is a five-year government contract with options for 3 additional five-year extensions. Faster Sales - GSA Shortens the Sales Cycle: Once you have a GSA contract, you can win work in 15 days on average. Lower Administrative Costs: GSA contracts are easier to administer than other government contracts. Simplified Proposals: Task order proposals required under a GSA contract are slim and concise, saving you time and money. Marketing Cachet: Enjoy the marketing cachet that becoming a GSA preferred, certified Federal contract conveys. Get your Piece of the Action: It makes Federal sales easier. Last year about $39 Billion in contracts went to businesses who were on the GSA Schedule. Federal agencies love to use the GSA program because agencies have the opportunity to meet small business goals, while promoting compliance with various environmental and socioeconomic laws and regulations. These contracts have no contract ceilings which makes it easier for agencies to issue larger contracts. You receive practical, straight-forward answers to your questions about getting a GSA schedule, contracting with the government, and improving GSA marketing and sales. What Schedules receive the most contract dollars? GSA Schedule Sales rankings. 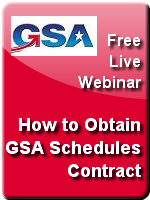 Does your Firm Qualify for a GSA schedule contract? Read Qualify for a GSA Schedule? The Myths about GSA applications. What is a GSA Proposal? While not exactly a GSA Contracts for Dummies book, the following eBook provides a concise explanation of the GSA Schedules Program. Need to brief your boss and colleagues about GSA Schedules? This PDF is a great tool to share and use. 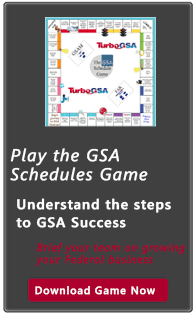 Each side of the game board describes key steps in the GSA Schedule process. While the above resources are great to download and review at your leisure, our monthly live webinar is very popular as we describe GSA Contracting in detail and due to small class size, can answer your specific questions. Maybe you are not sure if a GSA contract is right for your firm, and perhaps you are brand new to federal contracting. If so, download this eBook to learn more about government contracting. GSA Schedules: Which one should I go after? © 2013 Training Dimensions, Inc.